Archives of Eaton Bray News for September 2011. Cafe Community is back on Saturday October 8th from 11am until 1 pm. A warm welcome awaits you - so come along and meet up with friends old and new and enjoy a "lite" lunch or, if time is short, a cup of real coffee and a homemade biscuit. During the October Cafe Community and the November one on the 12th we shall also have a Craft and Christmas Gifts Stall available. This proved to be very popular last year, an opportunity to purchase those special gifts. See you there! The next Eaton Bray Parish Council meeting will be held on 3rd October at 7.30pm in the Coffee Tavern. So, the 2011 season has now come to an end, and it finished in style for the Sunday XI with 3 wins from the last 3 matches, to take them onto next year. Winning the toss and to no one in the home changing rooms surprise, Row were put into bat. Bray put on the pressure from ball one with an all round strong fielding display. Both opening batsman were back in the pavilion early on with the score on 16, courtesy of a wicket for Roff and a run out from J Peacock. Number 3 batsman and part-time Elvis impersanator D'Archembaud hit a patient 28, but after he fell to the spin of Tom 'Gun' Holloway, it was left to local rent-a-cricketer Alan Mead to help the Row up to a par score 155 all out with a well played 54. Wickets were shared round for Bray with Roff and Jones returning 3 each, with Harvey, Holloway and Paul dot-ball Davies taking one. Chasing 155, Kerins was out early, but the innings was rebuilt between young opener Louis Peek, who drove well throughout his innings, and skipper Peacock, who put on 55 before Peek succumbed to the spin of Lowde for a well played 14. Ringsell then joined his captain in the 16th over, and the ball was hit to all parts as the run-rate accelerated towards the total, Peacock bringing up his 8th half century of the season in the meantime went for one hit too many and was well caught at long-on by O'Sullivan for 56. In-form keeper batsman Alden kept the rate ticking along by putting on 48 with twinny Ringsell until Matt was out for a brutal 34, ending his season on a high with another solid innings. The 18 required after then was easily reached by Charlie and not out batsman Peacock snr (8 n.o) as Bray finished their season with a 6 wicket win. Personally, I would like to say, once again, thanks to everyone who has contributed in our Sunday XI this year, we've progressed again really well from our first games, and recorded 6 wins. Along with the core of the eleven from last year, in both Peacock brothers, Ringsell, Harvey, Roff, Hemming and Barker, we have been joined by Alden, Davies and youngsters Tickell, Green, Peek, Harris and Holloway who will contribute heavily again next season. We may even enter a league in the next year or two, to further develop the team's skills and due to the high numbers of available players this year, a 1st and 2nd XI team will be considered also, for future seasons. Highlights: The Row were inserted on a pitch with variable bounce and were soon in trouble at 76-6, but a 7th wicket partnership of 48 between A Mead 54 and K Mohammed 26 enabled the Row to reach a par score of 155 in their 40 overs.The Bray reached their target easily with over 5 overs and 6 wickets to spare. 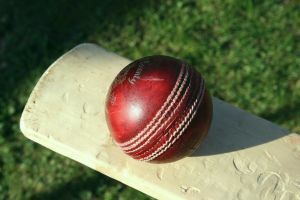 Cricket: Bray Sunday XI win again! Just!! The Sunday XI made it 2 wins out of 2 with a close victory over St Albans. With only 10 men making up the side and the twelfth man not answering his phone, Bray were hoping that a strong team effort would see them through. They lost the toss and were put into bat, totalling 157, with the backbone of the innings, being a 2nd wicket partnership of 72 beyween Charlie Alden and skipper Peacock. Alden contributed a brilliant 77, being his best for the club. In reply St Albans were quickly on the back foot as Ryan Peacock and vice skip Roff took wickets of both openers for 5 and 6 respectively as runs were kept to a minimum during the first 12 overs. The game then ebbed and flowed, until the introduction of Hemming and Tom 'Gun' Holloway swung the game back into Bray's favour with tight bowling and two wickets as figures of 1-17 (6) and 1-22 (6) respectively were returned. The off-spin of Harvey and leg-spin of Peacock was introduced, slowing up the run rate further, Peacock taking 2-15 from his 6 overs. At this point in the game, victory seemed certain, but the young side's inexperience then showed with misfields and over zealous throwing resulting in a tense final 4 overs as St Albans got all too close to the target of 158. Gladly, nerves settled within the last couple of overs and Bray held on as a pair of tight return spells from Ryan Peacock and Roff restricted the opponents to 149-9. Another win for our young team as the season comes to a close, but it could all have been so different. Have your say before Friday, 14th October. Every day of the year, Central Bedfordshire Council provides services to Eaton Bray and other communities around Central Beds. All of us will make use of some of these services, whether they are road maintenance, waste collection or the social care services that protect vulnerable children and adults; Central Bedfordshire Council spends more than £180 million a year delivering these services. Looking ahead, there will be less Government grant available for the Council than there has been in the past, as efforts to tackle the national deficit continue. There are also increasing pressures on some of the services provided by the Council because of increasing needs and rising costs. Central Bedfordshire Council achieved savings of more than £20 million already from reviewing what they do and how they work. This year they must save another £19m and expect further reductions in the next fnancial year. Taking all these factors into consideration, the Council is preparing a financial strategy for the next four years - and would like your views to be "at the heart of the plans". shape the plans and make your council tax money count! Complete the Budget Survey 2012 online. To have your say on the council's budget priorities, you can complete the survey online using the Budget Survey 2012 form. The feedback from this survey will help Councillors prepare options for savings for next year and beyond, with consultation on these options during December 2011 and January 2012. The Bray Sunday XI have endured a mixed season this year, with some good wins, in amongst big losses and close-run defeats. A core of team players, willing to play every week has been greatly satisfying and 5 new young players have been found this year, to add to our ever-growing club. Yesterday, individual perofrmances all came collective with a very strong performance against local opposition William Simmons. Bray were put into the field and ripped through Simmons line-up, as they capitulated to 98 all out. Debutant Tom Holloway returned impressive figures of 3-12 from 8 overs and was joined in his efforts by Ryan Peacock 2-28, the ever economical Joe Roff (1-23), Adam Holbrook playing in his first Sunday game since injuring his knee took 1-15 from his 8 overs and Adam Harvey mopped up the tail by taking 2-1 from 1.5 overs. The Bray openers knew that with a solid opening partnership, the win would be a formality and Kerins and skipper Peacock did just that, with a stand of 51, until the latter was out for 32, going past 1000 runs for the season in the process. Kerins was out for 18, Matt Ringsell added 28 not out in a rapid fashion and combined with debutant Harris (9 not out), Bray won easily. A great performance that will go a long way to install confidence in such a young and inexperienced team. Hailstorms aren't normally seen at the Bray in August but teatime saw such a torrential downpoor that there was no choice but to call off the game as the square was totally covered in an ice/rain mix! This may have been a good thing since asked to bat first on an already damp track the Bray had subsided to 92 all out with only Norris (37) putting up much resistance against the pace of Keeping (4-10). Who knows how the second half may have gone,but with Olney securing their first division status for next season we look forward to playing them on a sunny summer day! In the final league game of the season at Elstow, the home team won the toss and asked the Bray to bat. Opener Charlie Alden made the most of a little good fortune in constructing 38 and in partnership with Harris (31) saw off the opening bowlers as they put on 80 for the first wicket, this allowed Norris and laterly Flecknell (37) to play their shots as a total of 203 was posted. At one stage it looked like a bigger target may have been set but at the Bray "everyone gets a bat" these days and the spin of Course (3-43) saw off the Bray lower order. In reply Elstow got off to a poor start as they were unable to cope with the pace and full length of Ellerton, as he accounted for the top four batters. The Elstow innings recovered on the back of an excellent innings by Burraway (58) who saw of Ellerton and then began to push towards the target in partnership with Tanswell (31). At 180-8 the game was in the balance but Ellerton returned to have Burraway caught and finish with 6-28 as Elstow faded to 182 all out. An excellent game which a well as the innings from Alden also saw the return to competitive cricket of Adam Holbrook after a lengthy recovery from a serious knee problem. The Bray finished third and can rue a poor start to the season that left them playing catch up during the second half...It seems a long time til next April when we'll go again!! You are viewing the September 2011 archive.